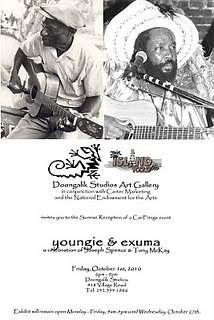 Pundit Larry Smith took a ride on the underground railroad of Bahamian music when he visited the Youngie & Exuma Exhibition at Doongalik Studios. “Last week I took a trip on the underground railroad of Bahamian music. Man, I was walking in Jerusalem just like John. I saw a number of signs, and all the guides remembered quite well. And sometimes, they even had fire and brimstone coming out of their mouth. The Youngie and Exuma Exhibition at Doongalik Studios was a fascinating celebration of the lives of Joseph Spence and Tony McKay. Kudos to Orchid Burnside, Doongalik Studios and Charles Carter from Island FM for making this glimpse into Bahamian music history possible. Visit the Music Channel on BahamasB2B for more on Music in The Bahamas.